I've been wanting to go diving for ever and just really haven't had the time to schedule it. Today I changed that. Ok well technically a few weeks ago I changed that when I completed the online e-learning. Ok and technically I haven't finished. 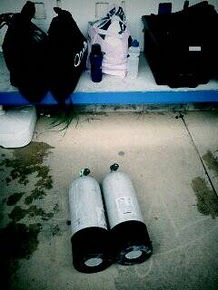 And technically I haven't done any exciting dives with marine life yet - I'm not counting the other people in my course. As I've been wanting to do this for a while, I was anticipating many things from this experience. As I shared with friends over the last few weeks my plans for this weekend many of them added layers of their own experience to my anticipation. Often when this happens I find I build the event up to something that is unrealistic and that the experience can't possibly live up to it. In this case that hasn't happened. I can't say I thoroughly enjoyed every bit of the training. Some of it was a little challenging. Some of it unpleasant - I'm not a big fan of smelling of chlorine. But overall it was great. I'm now anticipating next weeks ocean dives when I'm back from India. It's definitely time to commune with the fish. Random fact: J has a fear of big fish. Discovered while doing our dive training.